There are plenty of excellent reasons to seek orthodontic treatment. Straighter teeth are healthier, more attractive, and easier to clean. However, the idea of wearing braces for months can seem overwhelming. It you want to straighten your teeth without the discomfort or embarrassment of metal in your mouth, then it’s time to see Dr. Bingham-Lester and discover the unique benefits of Invisalign. Our practice is conveniently located in Gambrills, MD, serving Crofton and other communities throughout the area. You probably know what traditional braces look like. No doubt you’ve seen teens or adults wearing them. The metal brackets, connected by thick wires, are unmistakable, even at a glance. However, you might say that you’ve never seen anyone wearing Invisalign braces. In reality, you probably have, but you probably didn’t notice – and that is one of the greatest benefits to this innovative orthodontic solution. Invisalign is metal-free! Instead, these braces are made of crystal clear, nonallergenic resin. We won’t glue brackets to your teeth. It’s not just different materials, but also a different design. Invisalign straightens teeth with removable aligners, no brackets needed. Eat what you want, when you want. You’ve seen lists of foods to avoid when wearing braces. Well, you can avoid those lists when you wear Invisalign. The aligners are easily removed during meals, for trouble-free (and embarrassment-free) dining. Don’t destroy your teeth while straightening them. Cleaning around brackets is challenging, to say the least. Sadly, many patients are not able to effectively brush and floss, leaving them with decay or white spots when the braces come off. With Invisalign you clean your teeth easily and thoroughly after each meal, before the aligner goes back in your mouth. Invisalign is a completely different approach to orthodontic correction. The aligners are clear, thin, lightweight, comfortable, and conveniently removable. Yet, it has some things in common with classic braces. Aligners are not just for cosmetic correction. They can address the same types of malocclusion that metal braces can. The cost of orthodontics will vary depending on your needs. However, in general the two options are in a very similar price range. Timeframe, like cost, will vary. 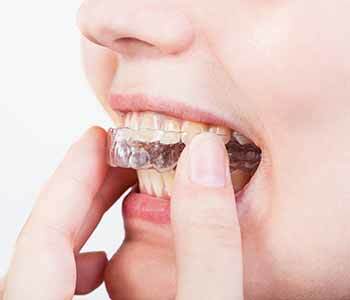 For some people, Invisalign might take a little longer or it might be a little faster than metal braces, but the difference is not likely to be significant. Are you ready to experience the benefits of Invisalign for yourself? If so, give us a call at 410-885-6522 and arrange a no-commitment consultation.